Transuniverse Forwarding is facing the future with a strong commitment to intermodal transport. In the first instance, we have set up a service between Belgium and Milan. We have invested in thirty “pallet-wide” containers for this route. In time, we will launch rail links to various European countries. Luc Genot has been appointed to expand the intermodal plans. He has been with Transuniverse since last October as manager for Wallonia, now he is also responsible for intermodal transport. He earned his spurs at NMBS Logistics (now Lineas) and Planisfer, a broker for rail-related logistics services. He therefore knows rail transport inside and out. The first link we will set up is a full freight service to Mortara, near Milan in Italy, because Transuniverse has a preferred partner there. It is, after all, essential to have a partner at the destination whom you can trust absolutely. “We are starting with full freights because they are less time sensitive than groupage shipments and we want to gain experience that way. We already use rail, for example with our combined transport service to Hungary, but the practical organisation for this is done by our partners. In the new set-up, we will be organising the transport ourselves, using our own equipment”, says Frank Adins, the Chairman of Transuniverse. 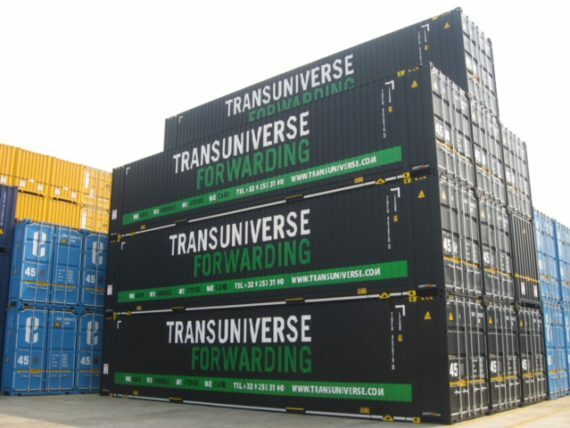 Transuniverse has purchased thirty “high-cube pallet-wide” 45-foot containers from Unit 45 for the service to Italy, which was launched in July. Twenty box pallets have already been delivered: ten classic closed containers and ten containers with side curtains, which lend themselves better to groupage. The remaining ten will follow in September. We are collaborating with rail operator Shuttlewise for the service to Italy. This company has five departures per week between Ghent and Mortara, so that we can scale up step by step and offer our customers a reliable service. “The intermodal service to Italy complements road transport to Italy. We will continue to use trailers. This is an extra service we are offering customers. They can choose according to prices, lead times and carbon footprint”, Frank Adins adds. Following the service to Italy, we are planning links to other countries. To start with, that will be the south of France, the United Kingdom, Romania and Spain.